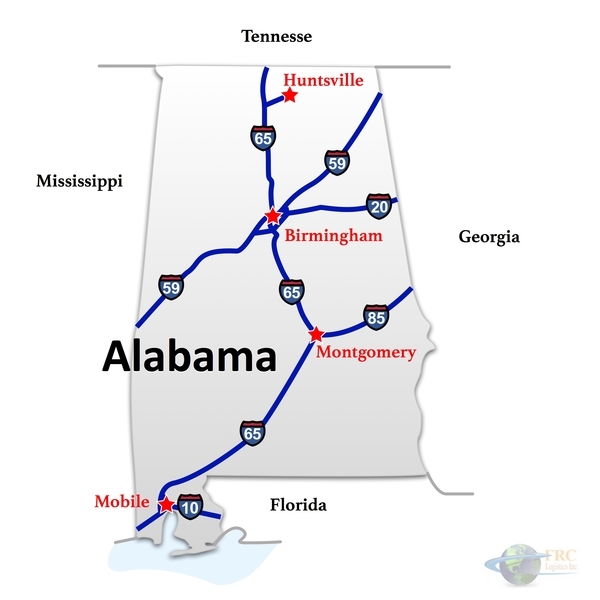 Florida to Alabama Freight shipping and trucking services are in high demand; Tampa to Birmingham is a major route from central Florida to central Alabama. The Tampa to Birmingham route is a 601 mile trip that crosses into Georgia through Atlanta making it a prime route for transportation. Shipping from Florida to Alabama can be a relatively a short distance considering they are boarding states with the farthest range from major cities being 925 miles from Miami, FL to Florence, AL. I-75 is the major interstate that runs North and South through Florida connecting cities like Orlando, FL to Montgomery, AL, the 464 mile trip starts on U.S. 231 before switching to the I-10 and onto the I-75. From Jacksonville, FL to the southern end of Alabama, transportation from Mobile, AL to Jacksonville, FL follows the I-10E for 404 miles passing through cities like Pensacola and Tallahassee. Florida to Alabama Freight shipping quotes and trucking rates vary at times due to the individual states industry needs. Since Florida and Alabama are both agricultural, food processing and food distribution centers, we see plenty of shipments by refrigerated trailer as well as by the more common dry van trucks. Our Less Than Truckload (LTL) carriers in both Florida and Alabama are also running a number of regular services between the two states, and it’s an active route for flatbed freight, as well.